The latest offering in our patented Micro-Cart® line, the MC3 like its predecessors, folds in two simple steps and has a small, folded footprint making it easy to get in and out of your vehicle. The MC3, due to its larger diameter tires is noticeably easy to push and has a sporty appeal. 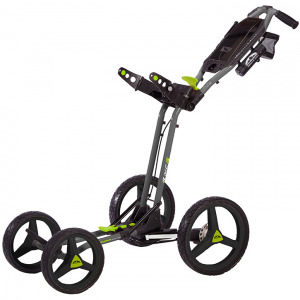 Folded Dimensions: 26.5" X 14.5" X 13.5"
If you have any questions regarding the 2015 Sun Mountain MC3 Micro Golf Push Cart, please give us a call, we would be happy to help you with any questions you may have. Write an online review on the 2015 Sun Mountain MC3 Micro Golf Push Cart, and share your thoughts with others.